Good morning. It’s sixth week. Don’t forget to vote in Student Government elections on Blueprint before 4:30 p.m. today! University names new VP and CFO: Cook County’s chief financial officer, Ivan Samstein, will serve as the University’s vice president and CFO starting in June. 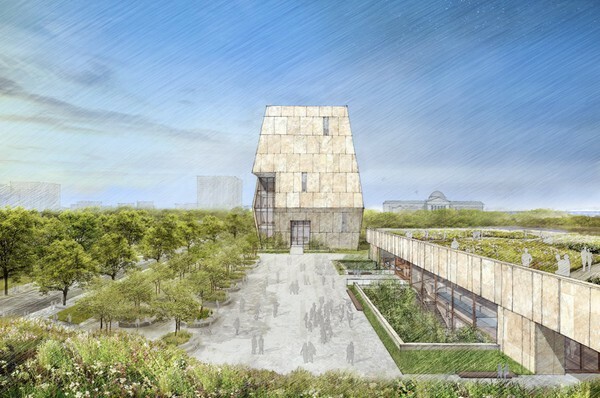 Plans for Obama Presidential Center: Barack and Michelle Obama unveiled the design at the South Shore Cultural Center on Wednesday. DNAInfo has a summary of the snazziest features the Obama Foundation has planned, including a recording studio, a movie studio, a new field house, food trucks, paddleboats, and a sledding hill. But not everyone’s happy with the way the announcements are being covered in the press. Responding to an Elle post about the plans, UChicago sociologist Eve Ewing tweeted demanding a commitment in writing to providing benefits for the community. An activist handing out flyers calling for a community benefits agreement was arrested at the speech for trespassing. Summer Breeze lineup: This year’s concert will feature Tinashe, D.R.A.M., and Sam Gellaitry. Tickets for the Saturday, May 20, concert go on sale at 11 a.m. tomorrow. Congratulations: Two faculty members have been elected to the National Academy of Sciences: mathematics professor Alexander Beilinson and finance professor Douglas W. Diamond. Economists disagree with Trump’s claim about tax cuts: Booth School researchers asked 42 top American economists whether President Trump’s proposed tax reform plan, which contains major tax cuts, would pay for itself through economic growth, Vox reports. Nearly all of the respondents said it wouldn’t. Incarceration is not the answer to gun violence in Chicago neighborhoods, Law School professor Randolph Stone and law student Maya Powe write in a Tribune op-ed. Watch: Chicago Tonight did a segment on a University of Chicago report recommending changes to the school’s disciplinary response to disruptive conduct. Ari Cohn of the Foundation for Individual Rights in Education debated alum Matthew Anderrson (M.B.A. ’96). New York Senator Kirsten Gillibrand will talk politics with David Axelrod at an IOP event on May 19. The legal director of the American Civil Liberties Union will speak at an annual lecture on June 1 hosted by the University’s Pozen Family Center for Human Rights. From our business team: The Graduation Issue is coming up! Don’t forget to buy your congratulatory advertisements. E-mail ads@chicagomaroon.com for more info. Bill O’Reilly’s dismissal from Fox News points to a larger problem of sexism within journalism, columnist Annie Geng contends. “The path toward gender equality, in journalism and beyond, can seem difficult, almost Sisyphean, but every small step in favor of women matters,” she writes. Seven artists gathered at Logan to answer a weighty question: “What is an Artistic Practice of Human Rights?” They showcased works across a range of media that explored the necessity of art with political effect. The third installment of a series on the Chicago Latino Film Festival ruminates on Ayiti Mon Amour, a Haitian drama that draws on the tensions of lived experience. The effect is a narrative that’s not quite a narrative, tinged with elements of magical realism and captivating local footage. The fourth explores La Habitación, a succession of vignettes on love, violence, and the human condition centered around the film's titular building. The stories—and the building—unfold across eight critical periods of Mexican history, and are not always easy to watch. “Mining the Tradition: Modern Voices Reanimate Historic Jazz” brought jazz musicians and academics from across Illinois together to reinterpret works by Andrew Hill and other luminaries, giving historic pieces a new lease on life. The South Side Weekly published its second-ever Food Issue, covering ice cream parlors, Chinese restaurants, urban gardens, brunch spots, and much more.